Flatbread? Is this flatbread? It sho looks like pizza from here! OK, so I don’t know what to call this beast, but it ain’t red, ain’t got no sauce, ain’t got no mozzerella, hell it ain’t even round, but it sho is good! 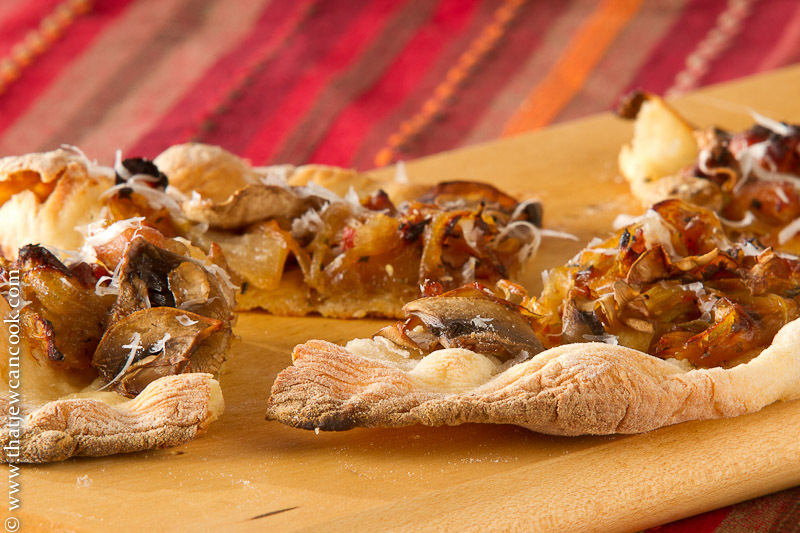 Flatbread just sounds so much better than pizza planks without sauce, doesn’t it? Who cares, just make this and you won’t have leftovers. Yesterday Nicole had some friends over for a spot of tea and finger sandwiches. Frankly, that’s a little too civilized for yours truly so I broke out the big guns: sausage, fennel, onions and mushrooms…and when I ran out of toppings I subbed in anchovies, capers and roasted peppers without skipping a beat. In lieu of sauce I carmelize the fresh fennel and onion, and you know I couldn’t leave out the pig. So, add some pig by way of sausage, sprinkle a little olive oil, crushed red pepper, and a faint wisp of parmigiano reggiano and bada-bing, I’m in heaven. 2 large onions, sliced thinly (not into rings, go vertically through the root). 2 lbs white mushrooms. You could probably get fancy and use porcini or shiitakes, but if you carmelize ’em right, the white mushrooms work just fine. Fresh herbs if you’ve got ’em. I like a little thyme. Never enough thyme. Make the dough several hours before you need it. Combine the yeast, sugar and warm water and stir. Let it rest and start to foam for 5 minutes. If it doesn’t foam, your yeast was dead and you need to run to the store and get some new yeast and start a new. Don’t be discouraged and just stop by the pizzeria, you can do this. Combine everything into your trusty mixer with a dough hook and let’r rip for 15 minutes. If it’s too wet, add more flour, conversely if too dry…you get the point. Let the dough proof in an oiled covered bowl kept warm for at least an hour, but preferably 2-3. I use 100 degree dehydrator for this (make sure the dough is well covered, otherwise you will get dough jerky). About an hour before you are ready to go, get your oven ripping hot. 500 degrees baby, and leave it be for an hour to really get things up to temperature. If you’ve got convection, throw that on as well. Might as well help get it going. If you’ve got pizza stones put ’em in. Extra points for you if you’ve graduated from pizza stones to 1/2″ thick sheet steel or aluminum. While waiting for the oven, you should start carmelizing everything. You can carmelize everything whenever you want, even the day before. Go for the mushrooms first, cut ’em thin to win and dump them into a frying pan with a little salt. Don’t move them. Even after they give up their liquid, leave them alone for a while. Stir a few times after you get scared you’ll burn them. Remove from pan, and toss a little oil along with the sausage, onions and fennel. Keep cooking on a medium temperature until they are all soft, mushy and dark. Mmmm. I cut my dough into tennis ball sized chunks and put them through my pasta roller. If you don’t have one of these, don’t fret, just roll out the dough manually. Its pizza kinda sorta, it should be fun. These should cook quickly, I didn’t time it, but I am thinking under 5 minutes. Keep checking it and remove when it looks right. When ready take ’em out and clean any remaining cornmeal off the pizza stone. You don’t want them to burn before the next round. Sprinkle with a little olive oil, your fresh herbs and some microplaned cheese. Acknowledge how much you (and the pig) rock, and chow down. All these toppings are right in my sweet spot, and I LOVE your recipe writing here (by all means, one wants to avoid “dough jerky”). Great post, Andy! I just need a glass of wine and I would be set for the evening.